Mornings in the Merrimack Valley just aren’t the same without Bruce’s voice coming into your home or car on WCCM/Lawrence. Mention the name Bruce Arnold anywhere in the Merrimack Valley of Massachusetts or in New Hampshire and chances are there’ll be instant recognition. Bruce was a part of life for residents there for forty-five years. He was heard for years in the morning on WCCM/Lawrence. This Lynn native began his broadcasting career in Conway, NH, then and on Armed Forces Radio & TV where he produced TV and motion picture training films. In 1959, he joined WCCM and, except for occasional excursions to Boston to work at WHIL (now KISS 108) and WBZ radio, where he was the regular fill-in host for Larry Glick and Bob Raleigh, he was loyal to the Merrimack Valley. He had an amazing run as a radio host and Program Director. Over the years, Bruce mentored many talented young personalities who went on to successful careers. Among them Dan Roche, WBZ radio and TV sportscaster, and Steve Holman, longtime play-by-play announcer for the Atlanta Hawks. 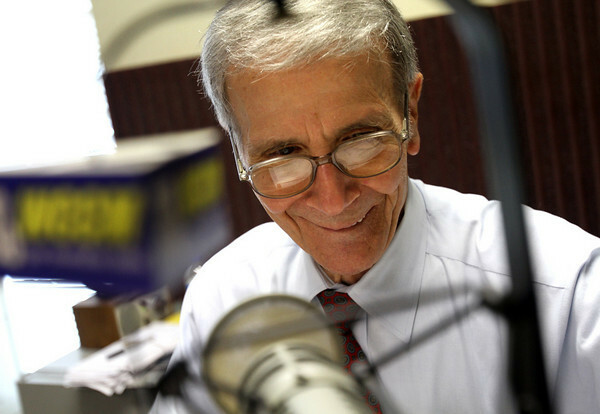 A masterful conversationalist, Bruce hosted music programs, interview shows, political debates, special events, and was the recipient of numerous awards including the Associated Press Radio Awards and the ACE Cable awards for his TV show, “Around Town with Bruce Arnold.” Bruce passed away at 79 in September 2015.